New Rochelle, NY, October 1, 2018–Researchers used continuous glucose monitoring (CGM) to assess the effects of adding dapagliflozin to a regimen of either metformin or insulin in patients with type 2 diabetes (T2D) and found significant reductions in mean glucose and other glycemic factors, with greater improvements seen in patients taking metformin compared to insulin. The design and results of this trial are published in Diabetes Technology & Therapeutics (DTT), a peer-reviewed journal from Mary Ann Liebert, Inc., publishers. Click here to read the full-text article free on the Diabetes Technology & Therapeutics (DTT) website. Diabetes Technology & Therapeutics (DTT) is a monthly peer-reviewed journal that covers new technology and new products for the treatment, monitoring, diagnosis, and prevention of diabetes and its complications. Led by Editor-in-Chief Satish Garg, MD, the Journal covers topics that include noninvasive glucose monitoring, implantable continuous glucose sensors, novel routes of insulin administration, genetic engineering, the artificial pancreas, measures of long-term control, computer applications for case management, telemedicine, the Internet, and new medications. 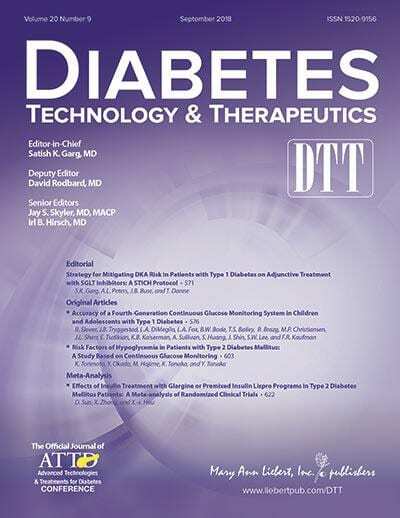 Tables of contents and a free sample issue may be viewed on the Diabetes Technology & Therapeutics (DTT) website. DTT is the official journal of the International Conference on Advanced Technologies & Treatments for Diabetes (ATTD). Mary Ann Liebert, Inc., publishers is a privately held, fully integrated media company known for establishing authoritative peer-reviewed journals in many promising areas of science and biomedical research, including Thyroid, Metabolic Syndrome and Related Disorders, Journal of Aerosol Medicine and Pulmonary Drug Delivery, Childhood Obesity, and Population Health Management. Its biotechnology trade magazine, GEN (Genetic Engineering & Biotechnology News ), was the first in its field and is today the industry's most widely read publication worldwide. A complete list of the firm's 80 journals, books, and newsmagazines is available on the Mary Ann Liebert, Inc., publishers website.